> Research Library > Cartera Commerce > Don't Just Find a Customer, KEEP Them! As you look to optimize your marketing reach and effectiveness, the options seem limitless. Consumer buying behavior has changed. The deal-first shopper makes acquiring new customers an initial challenge and maintaining their loyalty a close second. Learn how card-linked offers allow you to target, track and only pay after a sale is made. With upfront marketing costs covered by the payment and loyalty programs that are promoting your business and marketing reach to 60 million active shoppers, card-linked offers may help you optimize your marketing effectiveness. 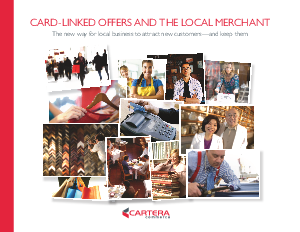 Get your free copy of "Card-Linked Offers and the Local Merchant" today.